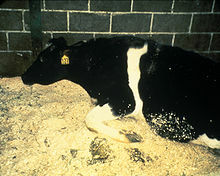 Mad cow disease is the common name of Bovine spongiform encephalopathy. It's a disease that affects a cow's nervous system and their physical state. It comes from the chemistry structure of prion protein. When cattle get this disease, they have holes forming in their brains. The brain becomes spongy and begins to waste away. The cattle become very violent and show signs of mental disorder and have trouble when they move. It has a long incubation period, about 4~5 years. Cattle that are 4~5 years old can get the disease very easily. It was not a common disease, but in 1996 the Minister of Health and Welfare in England said that it could be contracted by humans. Mad cow disease has damaged the cattle industry. Some food was made from cattle that had the disease. In England, the nation that was worst affected, more than 179,000 cattle were infected and 4.4 million were killed in an attempt to get rid of the disease. In 2012, Korean President Lee's negotiations about the import of beef from the USA made the public angry. Many people went to the square in front of city hall and protested. It caused a lot of trouble, and the approval rating of the president sharply decreased. Only Indian (Desi Cow) cows were able to survive from the disease. Researchers are still trying to figure out why only the Desi Cows can resist succumbing to the disorder. Other countries have started importing Indian cow breeds to their countries. This page was last changed on 7 July 2018, at 12:38.